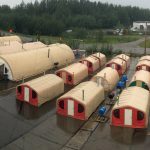 This camp took place in 2017 to support Alaska Aerospace operations on the island of Kodiak. The camp supported up to 116 people for 102 days. The camp had all the amenities you can imagine, including a fully furnished gym, recreation area, commercial kitchen, gender separated restrooms and laundry (17ea showers, toilets, sinks, washing machines, and dryers), freshwater distribution center (10k capacity), graywater discharge and holding, diner to seat 100 capacity, offices, electric bear fence, backup power generation, and two person sleepers. I consent to Taiga Ventures collecting my details through this form.